It’s been a while since I posted an article on this blog. Before I get kicked out of the Baseball Bloggers Alliance, I thought I’d give you an article about this-and-that about the A’s during the last couple of months, in no particular order. Where I’ve Been: First, let me explain my absence from these pages. I needed to get my 120,000 word novel into final form with the help of my free-lance editor, Rick Hurd. Once that was done (Is it ever done? ), I began last week the unenviable task of trying to find an agent to represent my novel Contract Year: A Story about Love and Baseball. I had to do a lot of research trying to find agents who like baseball, which is not easy to do. That’s not something they usually share in their agent profiles. So far, I have queried 3 agents and I have identified another who likes sports. So that’s why I have not posted an article in almost 2 months. A’s New Radio Station: During the off season, the A’s attempted to buy their flagship radio station KTRB, which had filed bankruptcy. A deal couldn’t be accomplished, so March 31st the A’s announced that they have a new flagship station, KBWF FM 95.7 “The Wolf,” a country and western station with perhaps the strongest FM signal in the Bay Area. Given the problems with reception in various places in the East Bay and elsewhere that we fans experienced in the last few years, this is very good news. Apparently AM radio popularity is waning and FM is gaining in popularity rapidly, and is expected to take over the sports broadcasting market in the near future. The A’s are currently the only MLB team whose sole flagship station is in FM format, and the broadcast quality is vastly superior to AM. Several other teams have both AM and FM stations carrying the same braodcast. On April 15th, only 2 weeks later, KBWF rebranded itself as Sports Radio 95.7, changing it’s format to full-time sports talk radio. This allows the A’s pregame show to expand to a full hour and Chris Townsend’s post-game call-in show to last at least an hour and sometimes longer. In short, this is a really good situation for the A’s and their fans and will continue through the 2014 season under the current contract. FYI, KBWF is also the flagship radio station for the San Jose Sharks. Sacramento River Cats:The A’s extended their contract with the Sacramento River Cats, the A’s Triple-A affiliate since 2000, through the 2014 season. In 2010, the Rivercats won their 9th Pacific Coast League Division title in 11 years, and the team has won 4 PCL Championships since they joined the A’s organization. They also led Minor League Baseball in attendance during 9 of the last 11 years. A’s Shuffle Minor League Affiliates: The Burlington Bees of the Midwest League is now the Single-A affiliate of the A’s in the Midwest League, replacing the Kane County Cougars. The Bees were the Single-A affiliate of the Kansas City A’s from 1963-1967 and continued as the A’s Single-A affiliate for 6 more years after the A’s moved to Oakland. FYI, this season so far, the Bees are 8-2, leading the Western Division with the league’s best W-L record. Kane county is in last place. A’s Coaching Changes: Curt Young, who was the A’s pitching coach for the last 7 years, is now the pitching coach for the Red Sox. We are all sad to see him go but wish him the best of luck. Ron Romanick, at left, the A’s bullpen coach for the last 3 seasons, was promoted to fill Curt Young’s shoes with the A’s. Before becoming the bullpen coach, Romanick spent 9 years as the A’s minor league roving pitching instructor, and was instrumental in developing pitchers Trevor Cahill and Dallas Braden and others. The bullpen duties are now handled by Rick Rodriguez, who has been the pitching coach for the Sacramento River Cats for most of the last 10 years. Also, Gerald Perry is back as A’s hitting coach, replacing Jim Skaalen, who held the position during the last two seasons. This is Perry’s second stint as A’s hitting coach (2006). In addition, Joel Skinner, who came over from the Cleveland Indians, has replaced Tye Waller as A’s bench coach, with Waller sliding over to first base coaching duties. Trainers and Other Medical Changes: Steve Sayles is no longer the A’s head trainer. Nick Paparesta, who was the assistant trainer for the Tampa Bay Rays for the past three seasons, has assumed the reins. Walt Horn remains an assistant trainer along with Brian Schulman, who was a trainer at Cal Berkeley for the last 7 years. for the permanent nerve damage when they nicked a nerve during a cyst removal from his foot. He has no feeling in part of his foot, which affects his pitching delivery, his perfect game notwithstanding. Ticket Sales up: A’s season ticket sales are up 50% this year. It validates the moves that Billy Beane made this offseason. (See previous post on this blog here.) The presence of Hideki Matsui probably accounts for much of the rise. Also, inspite of playing in a bad ballpark, threats of moving the team elsewhere, and some anti-fan moves (like the tarps and cancelling the annual FanFest), people still like the A’s a lot and remain loyal. Facebook Study: The social media giant conducted a study of members who “like” their teams. Phillies fans were found to be “most loyal”, St. Louis Cardinals are most beloved by women, but the Oakland A’s fans are the “most social,” meaning they have the most friends on Facebook. A’s fans are the only team-based community that averages over 500 “friends” per member. A’s fans are also the “most scattered around the country”, are “among the youngest”, “most likely to be single”, and “most male-centric in the major leagues.” You can read the report here. Now to Leave Lou With Something Musical. One of my favorite baseball songs is entitled, “Somewhere between Old and New York” by Dave Grusin, Randy Goodrum and Dave Loggins, and sung by Phoebe Snow. Enjoy it here. Listen carefully to the lyrics. They are pure poetry. Bob Feller Diagnosed With LeukemiaLegendary pitcher Bob Feller recently revealed that he is being treated for Acute Myeloid Leukemia, a type of the disease that is very common in elderly men. Feller is 91 years old. “It is curable, but not guaranteed,” he told the Cleveland Fox News Affiliate. Bob is the third oldest living Hall of Famer after Lee McPhail and Bobby Doerr, who are both 92. The day he announced his condition, he was in his regular seat in the Indians’ Press Box, after missing 5 games while undergoing outpatient treatment at the Cleveland Clinic. He makes regular appearances on behalf the the team and is much loved by Cleveland fans. You can read about my experience meeting him in April at Spring Training in my post entitled, “Meeting Bob Feller.” Check it out. (Contra Costa Times website) had a note about a brief ceremony in the A’s clubhouse, at which Co-Owner Lew Wolff presented Dallas with a diamond ring honoring him for his perfect game. On June 18th, 28 year-old Justin James was a pitcher for the Kansas City T-Bones in the independent Northern League. He had pitched in the Toronto and Cincinnati organizations before being released in 2009, following an injury-riddled 2008 season. He signed on with the T-Bones because they were the closest indie team to his home in Yukon, OK.
On June 19th, the A’s signed him to a minor league contract and he spent the last two months between Double-A Midland and Triple-A Sacramento, posting a 1.83 ERA and 49 strikeouts with only 16 walks in 39 1/3 innings. “I can’t stand walking people,” he said. “I’ve always been against it.” (We need more pitchers with that attitude and the ability to put it into practice.) He throws a 95 MPH fastball. Last Wednesday, Justin got “the call” and reported for his major league debut, which turned out to be at Yankee Stadium, where the A’s were playing a 4-game series. We won’t talk about how that series went. Let’s just say that it went better for Justin than the team. He came into the game and pitched an inning, giving up 3 hits and an earned run with 2 strikeouts and a walk. Not bad against the mighty Yankees. In yesterday’s game against the Angels, he fared better, pitching an inning and and allowing just 1 hit. That’s it for now. Hope everyone had a wonderful Labor Day Weekend. My friend Marvin sent me an article about Dallas that says a lot about the man who pitched the 19th perfect game in the history of Major League baseball. It was written by Tim Brown of Yahoo Sports. It is definitely worth a read. By now you have undoubtedly read many articles about Dallas Braden pitching a perfect game on Mother’s Day. He is to be congratulated for his outstanding effort Sunday, to become only the 19th pitcher in Major League history to accomplish that feat, and the 2nd A’s pitcher to do so. Catfish Hunter pitched the other on May 8, 1968, 44 years and 1 day before Dallas’ perfecto. Dallas Braden is such an unlikely hero. He was never a “prospect” (the top echelon of players in a team’s minor league system). In fact, he was drafted by the A’s out of Texas Tech in the 24th round of the 2004 June Draft, and was the 1383rd player taken overall. Definitely not on most people’s radar. 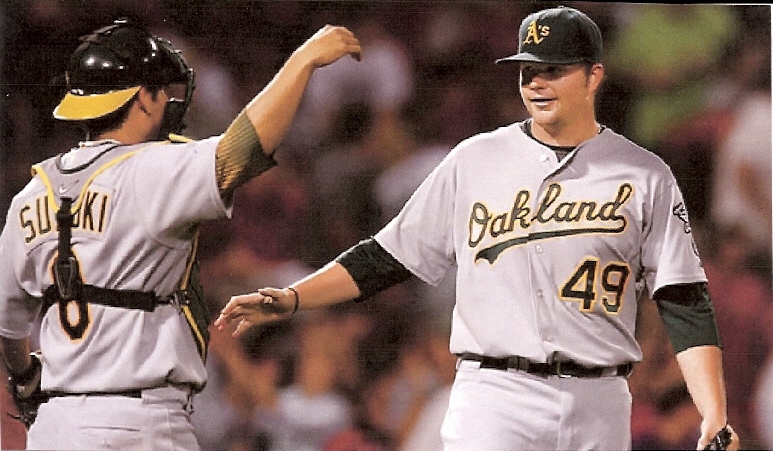 Even in 2005 when he was the A’s Organizational Player of the Year, having won 15 games that year, he was ranked only the 19th best player in the A’s minor league system by Baseball America. In 2006, he didn’t crack the top 30. In 2007, he was called up when Rich Harden went on the DL, and won his first decision but lost the next 8. Hitters had a .303 batting against him, and his ERA was 6.72. Nothing to write home about. A-Rod has never been one of my favorite players, though his stats speak volumes about his abilities on the field. His ego is regularly on display and he can be downright rude. He appears all too often in the media, and much of it is not flattering. So when he belittled Dallas after the latter complained about his walking across the mound, I was and still am firmly on Dallas’ side in this. Well, Dallas made a big statement to A-Rod with his pitching arm on Sunday. Word has it that the Yankees were in the clubhouse that day and had the game on TV, probably because the A’s were playing the Rays who were at the top of the Eastern Division with the Yankees nipping at their heels. Anyway, A-Rod disappeared to some other part of the clubhouse, refusing to watch Dallas pitch. When the no-no got into the 5th inning, someone found A-rod and told him he’d better get in to watch the game, but he still refused. After the 8th inning, some members of the Yankees found A-Rod and dragged him in and made him watch the top of the 9th. What a jerk! Yes, Dallas’ 17 career wins in three years in the Majors may not impress A-Rod, but you might be surprised to know that one of the 18 other pitchers to accomplish the feat had even fewer wins. Charley Robertson of the 1922 Chicago White Sox only had 1 win before pitching his perfecto, in his 4th career start. Thanks to David Feldman, the A’s Historian and an MLB Official Scorer, I can share some other interesting facts about Dallas’ accomplishment. Did you know that given that only 19 perfect games have been pitched, that’s approximately 1 perfecto for every 11,000 games played? And Dallas’ is the 2nd perfect game in a row pitched against the Tampa Bay Rays? Mark Buehrle did it on my birthday (July 23rd) last year. Sunday’s game was also the first perfect game ever pitched on Mother’s Day, and the 2nd A’s perfecto using one pitcher (the aforementioned Catfish Hunter) and one catcher. Both Ray Fosse and David Feldman mentioned one other perfect game pitched by the A’s but it involved 4 pitchers and 2 catchers, so it isn’t considered one of the 19. It is also interesting to note that in the first 100 years of Major League baseball, 11 perfect games were pitched. 8 have been thrown in the last 22 years. Either pitchers are getting better, or hitters are not as good as they used to be. I’ll place my bet on the former. Unfortunately, I was not present to watch Dallas work his magic on Sunday. I had to be content with seeing on our HD TV, and I’m not complaining. I especially enjoyed watching Dallas and his Grandmother, Peggy Lindsey, hugging after the game for a long time. Dallas was clearly emotional, holding on the the woman whom he believes saved his life after his mother died when he was just starting his senior year in high school. We got a much better view of the moment on TV. I was, however, seated in the first row behind the visitors’ dugout at Dodger Stadium on July 28, 1991, when Dennis Martinez of the Montreal Expos threw a perfect game beating the Dodgers by a score of 2-0. Former A’s catcher, Ron Hassey was behind the plate that day. He was a little surprised that someone would flag him down at a Dodger game and call him over to talk. That would be me. He was very gracious with his time. By the way, he is the only catcher to catch 2 perfect games! Los Angeleans are an interesting crowd. They straggle in around the 2nd or 3rd inning and start leaving in the 7th inning “to beat the traffic,” as I was told. No one left that day and we all stood up during the entire 9th inning, and applauded every pitch that Martinez threw, even though he was pitching for the visiting team. It was truly exciting to witness the 13th perfect game ever thrown. I wish Dallas Braden all the success in the world after what he accomplished on Sunday. I’m not sure he’s quite prepared for what will happen to him from now on. He began doing national interviews from his Stockton, CA home early the following morning. They continued later that day, after the A’s charter flight landed in Texas, where the team begins a 3-game series with the Rangers tonight (May 11th). Apparently, he delivered the Top 10 list from the Ranger’s clubhouse on David Letterman last night. He also taped an ESPN Sports Center interview, and appeared on “All Things Considered” on NPR. I was at the game last night. The A’s played well but the Angel’s guys are just bigger, stronger, better and luckier than our guys. They belong in first place and, I am sorry to say, we belong in the cellar. who gave up 6 earned runs on 10 hits, his worst appearance of the season. Aside from him, the rest of them just look lackluster. Of course, Santana has baffled the A’s for a long time. His record against the A’s is now 10-1. But he didn’t have his good stuff last night and we still couldn’t do much against him. The nail in the coffin was probably Howie Kendrick’s phenominal stab of a screamer hit by Jason Giambi that could have been a run-scoring double, but resulted in a double play instead. Not the kind of Double-Double that I like. After that happened, it seemed that the whole stadium heaved a sigh of resignation. It was sad really. The only bright spot was Matt Holliday’s towering homer. Maybe today’s game will be different. I sure hope so. But something needs to happen to shake things up. Because isn’t the definition of “crazy” doing the same thing and expecting a different result?